Τhe Director of the Euro-Mediterranean Network for Economic Studies – EMNES and President of the Euro-Mediterranean Economists Association – EMEA, Prof. Rym Ayadi, participated to the Atlantic Dialogues 2018 Conference, under the theme: Atlantic Dynamics: Overcoming the Choke Points, which took place in Marrakesh, on 13-15 December 2018 under the High Patronage of His Majesty King Mohammed VI. Since its inception in 2012, the Atlantic Dialogues (AD) conference has become a well-established annual meeting point, bringing together around 350 high-level senior officials, business leaders, academics, opinion shapers and civil society actors. 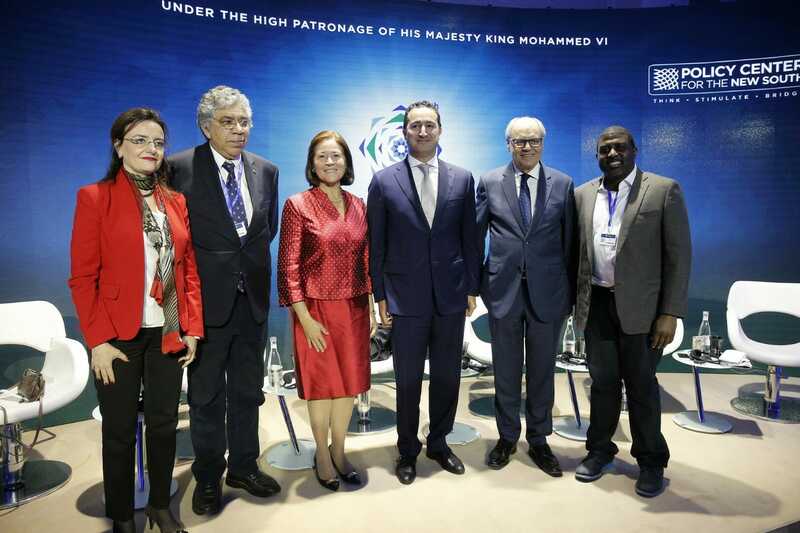 Prof. Ayadi participated to the session “10 Years after the International Financial Crisis: Is the Next One Looming?” along with Othman El Ferdaous, Secretary of State in charge of Investment, Ministry of Industry, Investment, Trade and the Digital Economy, Kingdom of Morocco, Maria Eugenia Brizuela de Avila, Former Minister of Foreign Affairs, El Salvador, Otaviano Canuto Dos Santos Filho, Senior Fellow, Policy Center for the New South and Edward Scicluna, Minister for Finance, Government of Malta. During the session she highlighted that risks have accumulated over decades and erupted in 2008. Some of these risks have not been known or managed properly. Financial crises will always happen because are neither identified nor managed properly. The risks underlying the next financial crisis are being already accumulated. On the impacts on Africa and MENA, she emphasised that the determinants of economic crises are not the same for all countries and regions. Idiosyncratic factors are macro factors are combined differently in countries and regions. However, countries and regions must develop their resiliency frameworks to resist adverse macroeconomic conditions. Furthermore, Prof. Ayadi also participated to the Breakout Dinner “Big data in Africa”, chaired by Vandana Chandra, Former Senior Economist, World Bank, where it was discussed on how big data can drive innovative solutions in the African continent. Prof. Ayadi underlined that Africa has large potential for economic development, big data and AI can bring opportunities via a wave of innovations (for small and medium businesses in traditional and new sectors) and has large potential in terms of entrepreneurship engaging particularly the youth in this transformational process. She however emphasised that Africa is lagging behind in terms of investment and data collection and quality. The hunt for data is already beginning – using mobile networks, social media, and other data cloud systems. Several applications are being developed using satellite data for farming to increase the productivity of crops.